Wet one side of the watercolor paper under tap water. Mix white with blue or purple to make varying shades of the colors. Completely cover the paper with paint. Once its covered hold it up vertically so that the colors can run and blend together. Create as many sheets as you’d like then let dry. Once the paper is dry paint the other side of the paper. Make a star pattern by tracing or draw a star shape. Once the paper is dry trace the star shape on the paper and then cut out. Punch a hole at the top of each star. Cover the star with glue from the glue stick. Sprinkle glitter over the star. Let dry then hang with string. What wonderful ideas! Thank you for sharing. For the stars, I thought it would be great to make 30 of them at the start of ramadan and put one up each night, so that by the end of ramadan you will have a home decorated for Eid! 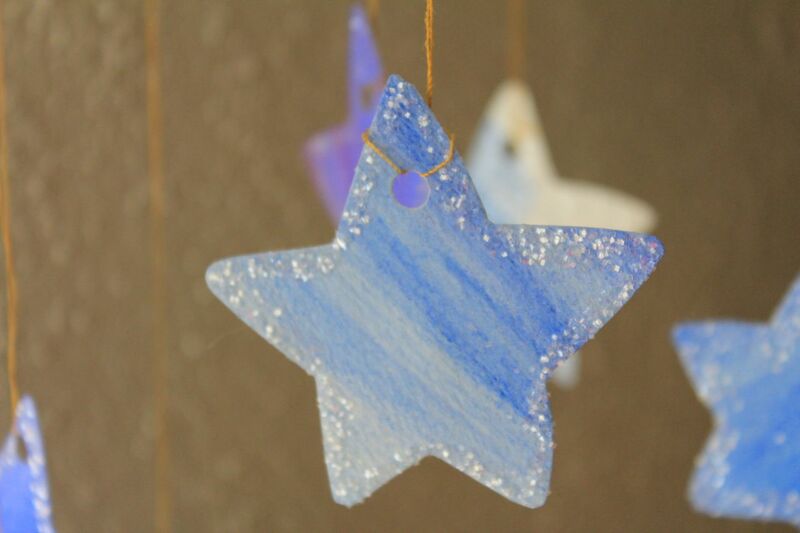 Children could also put up special stars (gold or silver ones) for each day that they fasted. Beautiful idea. If you do it be sure to send me a photo, I’d love to see it.